Om Rudrapriya is one of the finest holiday resorts in Ranthambore which is roundly located at the edge of magnificent tourist wildlife destination Ranthambore National Park. 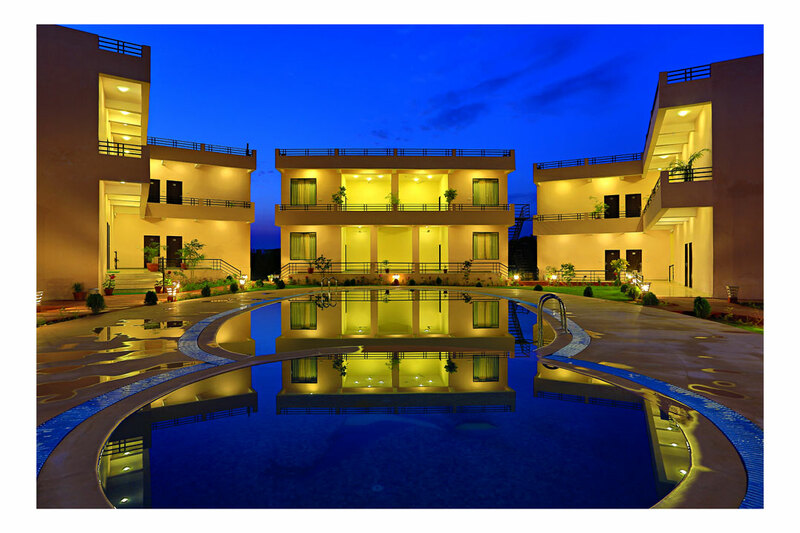 It is a unique hotel at ranthambore that hold the narration, sense, and glamour of the Royal Bengal Tiger. It's all fitted to capture your fantasy. Om Rudrapriya is a luxury deluxe hotel with modern facilities to make your stay comfortable and memorable. There is a sprawling green lawn area in the hotel where you can enjoy with recreational activities. A central swimming pool in the hotel creates a charming ambiance. You can have a lifetime experience with premium service and high end facilities during your stay at Om Rudrapriya. Enjoy the wildlife safari, its marvelous view, the natural beauty, flora and fauna and the majestic tigers and hotel great hospitality among all that! Om Rudrapriya Holiday Resort offers a wide range of accommodation including 32 deluxe room and 04 luxurious suites to their guests. The hotel truly offers a view of stunning landscaped garden with all rooms. All rooms have excellent designed with western furnishings. All rooms are well appointed with modern amenities such as air conditioned ,attached bathroom, writing desk with chair ,hair dryer , satellite TV, slippers and hot and cold running water. Rudrapriya Resort has a well equipped dining hall with multi cuisine restaurant and bar. It is offer Chinese, Indian, Continental, Tandoori, Guajarati, Rajasthan and south Indian cousin where you can enjoy a delicious meal.